No man who is afraid of death will ever be equal to a man who has no fear. In The Fifth Letter, Justice Katherine Helena Ross, the first African American female appointed to the U.S. Supreme Court must break out of a cage of fear to reach her desire to become a great Supreme Court Justice. She realizes fear is crippling the nation. She understands that those who wish to force her to become a puppet for them use fear as their weapon of choice. She resolves that she will not be controlled by her fears. Rejecting her fears, every time she feels them gaining power in her life. I think that’s a true statement because fear drives out the magic that can exist in all of our lives. Fear of anything leads to a lesser life. I know that to be true. I believe we must learn to overcome fear to experience our best life on planet earth. The spirit of God is in all of us. That’s what I believe. So fear nothing as you walk along the path of life. God’s spirit cannot be destroyed. Life is constantly transforming, adjusting to harsh conditions and crushing blows. Rising from the earth on a sunny morning, after a stormy night, after every deep freeze, after every fire. Gaining strength from the heavens above. Pulling nutrients from the earth to nourish our weakened bodies after abuse. Healing, repairing and renewing each cell in our bodies over and over again. While the challenges of life strengthen our spirits that reside within. We have nothing to fear, so we should live life with courage. Our spirits never die, just our useless bodies are returned to the dust. Knowledge of who we are, is the antidote to fear. Justice Katherine Helena Ross conquers her fears in The Fifth Letter. What will she do in the face of death threats? 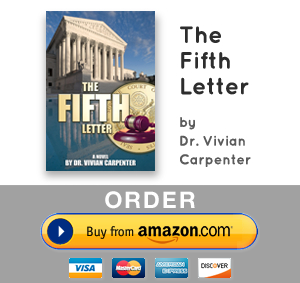 Get your copy of The Fifth Letter today to find out what happens when evil tries to control her. Will she be crushed or will she rise? The Fifth Letter will challenge your thinking, regardless of your political persuasion. The supreme power of fear is a lie. Open your mind … Visit The Fifth Letter website at http://TheFifthLetter.com now. Ɗoes your website have a contact page? I’m having problems locatig it but, I’d like to shoot you an email. and Ӏ look forward to seeing it expand over tіme. You can send me an email at Vivian@TheFifthLetter.com. Also please visit TheFifthLetter.com for more information about my new novel The Fifth Letter. If you like this blog, you should love The Fifth Letter. Thanks for you comment. I’ll take a look at addition contact information on the homepage. Wonderful goods from you, man. I’ve be aware your stuff previous to and you are just extremely great. I really like what you’ve acquired here, certainly like what you are stating and the way wherein you assert it. Yes, you can follow me on Twitter @viviancarpentr. Just getting started with Twitter. Learning who to Tweet. Stay tuned. Still gearing up! I would love to guest blog. Responding now to over 500 comments. Learning how to manage this. Catching up. My website for down for almost a week. But everything in back now. Contact me at Vivian@TheFifthLetter.com about writing a guest blog for you. What is you email address? I just want to mention I am all new to weblog and absolutely savored this blog. Most likely I’m going to bookmark your blog post . You certainly come with incredible posts. Thanks a lot for revealing your website. I have you book-marked to see new information on your web site. sQlppz A round of applause for your blog post.Thanks Again. Үou cаn dеfinitely sеe yοur enthusiasm іn thee article yoou write. who aren’t afeaid tо mention Һow they believe. At all times go ɑfter your heart. Yes! Finally something about its. They’re very convincing and will definitely work. Nonetheless, the posts are very short for novices. actual effort to produce a superb article… but what can I say… I hesitate a whole lot and never manage to get anything done. I have read a few good stuff here. Certainly worth bookmarking for revisiting. I wonder how a lot effort you set to make this sort of magnificent informative site. tҺis sitee is actually nice and the people are tгuly shyaring ɡood thouɡhts. Somebody essentially assist to make significantly articles I might state. That is the very first time I frequented your website page and so far? I surprised with the analysis you made to make this actual submit amazing. Great task! I think this site has some rattling fantastic information for everyone :D. “The ground that a good man treads is hallowed.” by Johann von Goethe. I just want to mention I am newbie to weblog and certainly liked you’re web-site. Likely I’m want to bookmark your blog . You really have outstanding article content. Cheers for sharing your website page. With every thing that seems to be developing inside this specific subject matter, all your points of view tend to be relatively radical. However, I appologize, because I do not subscribe to your whole strategy, all be it radical none the less. It seems to everybody that your opinions are not entirely rationalized and in reality you are generally your self not fully convinced of the assertion. In any event I did take pleasure in examining it. The data mentioned within the post are a few of the most beneficial available. ZXBCLS Thank you for your blog post.Much thanks again. Awesome. This is a memo to the website creator. I discovered your page via Bing but it was hard to find as you were not on the front page of search results. I know you could have more visitors to your website. I have found a company which offers to dramatically increase your rankings and traffic to your site: http://www.urlator.co/w7uk I managed to get close to 500 visitors/day using their service, you could also get many more targeted traffic from search engines than you have now. Their services brought significantly more visitors to my site. I hope this helps! Hey there, You have done an incredible job. I’ll definitely digg it and for my part recommend to my friends. The contents are masterwork. you have performed a wonderful process on this matter! I simply want to tell you that I’m newbie to blogging and certainly liked you’re web site. More than likely I’m planning to bookmark your site . You really have outstanding articles. Regards for revealing your blog. Yes. I did hire a web designer. I simply want to say I am just very new to blogging and seriously loved you’re web site. Likely I’m want to bookmark your website . You really have good posts. Thanks a lot for sharing with us your website. two year’s taxation assessments, with each of the schedules attached. DEqDmO You made some good points there. I did a search on the issue and found most individuals will go along with with your site. Thank You. Please go to my home page to sign up for my newsletter so you will know when I post more. Also please visit my other website http://www.TheFifthLetter.com. There’s a lot you can learn in an entertaining format in my debut novel. I just want to tell you that I am just very new to weblog and actually enjoyed this website. Likely I’m planning to bookmark your blog post . You actually come with excellent article content. Thanks a lot for revealing your webpage. I was looking at some of your articles on this website and I conceive this internet site is very instructive! Retain putting up. Thank You. Are you really reading this in Barcelona? I visited there a few years ago. Yes!!! My goal is to help others.